Bringing the biggest gaming franchise in the world to the iPhone/iPod Touch certainly took a lot longer than some people had hoped. Now that it’s here, the biggest question is whether or not it can live up to its name. Grant Theft Auto: Chinatown Wars is adapted from the PSP game of the same name. You play the “bratty” progeny of a recently killed Chinese gang leader. Your mission, come to the United States, find his killers and along the way, make some money. The opening scene of GTA: Chinatown plays out like a movie showing quite a few cutscenes, one after another. Through these scenes you find out who your character is, what he is doing in New York and see the outcome of his Liberty City arrival. All in all, these are well done, as most of the cutscenes are throughout the game. Just note that when I say cutscenes, I don’t mean it in the same sense as the console GTA game. Instead, you are shown captions for the characters along with a comic book like shot of what is going on at that moment. It’s understandable that live action cutscenes are not included and won’t result in a lower score for the game. The game brings you into the world and has you doing missions fairly quickly. Many of the same things you do in the other GTA games – Finding your safe house, going to missions, etc are all done here on the iPhone/iPod Touch version as well. I have to say that overall the production value is very good indeed. Many of the things that you can do in the console versions can also be done in this game as well. The in car GPS allows you to pick a point which the map will show you being created on the screen. There are several different radio stations that can be selected as you drive along. You also have a PDA/Laptop to check your emails and make a save at any time (other than when you are in a mission). You can even change the theme of your PDA (I know some of you care even though I do not). As with any GTA game, the real game is not only in the missions but what else you can do in the environment around you. There are quite a few good jokes thrown into most of the game’s environment. Things shown on newspapers, ads, lines said by characters, written in your email, etc make Liberty City a really satisfying place to be. You can drive taxis, ambulances, and police car’s and do missions for each type of transportation. Picking up travelers, killing criminals and saving lives adds a lot to the amount of time you will spend playing the game. Add in that every mission within the game can be replayed in a different mode that times you for how quick you can do it and this game offers an enormous amount of gameplay. There are also side games and outlets for spending your money. Want to go buy some scratch off lotto tickets? Go ahead. Better to waste your money in GTA than in real life. So how do the controls stack up within the game? Certainly an important question since a game like this asks you to utilize them throughout to do many different things. The answer is that they are done very well. Driving is made simple by virtual left or right directional arrows. No need to use the virtual analog stick. A good idea since the virtual analog stick in most driving games is easy to lose track of with your thumb. The controls on the street use the aforementioned virtual analog stick which works extremely well and shooting is done by pointing yourself in the right direction and click shoot. An auto targeting function takes car of the rest. Jumping, punching, car stealing and kicking can also be done using virtual on screen buttons. The sound in the game is great. There are 5 radio stations built into the game. While none of them have any words, they each have a different feel to them – reggae, rock, rap, etc. The 6th station can be a custom station you create yourself. Simply create a playlist on your iPhone or iPod Touch called GTA, select the independent radio station in the menu and your good to go. The rest of the game has decent sound throughout. Squealing tires, purring engines, dying gangsters, etc are all here. One issue with the music is that you can’t play it outside of the car. It is kind of disappointing that they reverted back to not being able to do this after having this option in GTAIV. When I started writing this review I had no idea how I was going to cover all of the things you can do throughout the game in our usual word count, about 700-800 words. I think I have my answer – there is simply no way to cover this game in one simple review that goes through all of the basic things you can do and tell you about some of the surprises that jump up along the way. For me the main storyline was just a side note because I love to do all of the other things that Rockstar has added to the game. That being said, if you’re a storyline buff, you are likely going to enjoy this one as well. A few twists and surprises around every bend. I hate to come off so glowing in any review but I have to tell you the truth. If you like the console versions of GTA, enjoy its gameplay, and love the deadly environments that you are thrust into then you will definitely enjoy Grand Theft Auto: Chinatown Wars. There I said it. Now time to get back to the game. Cody likes sports, games and sports games. He has also been known to read about sports, games and sports games. 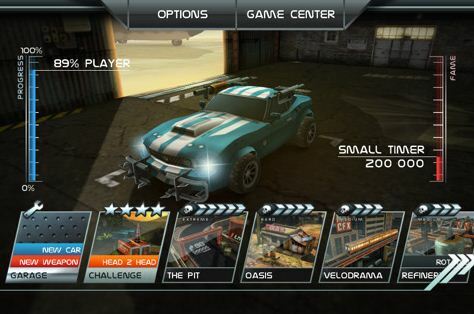 iPhone Gamer Blog reviews iPhone, iPod Touch and iPad games in the most honest way we know how. By pointing out good points and bad with a specific slant towards a game’s value and replayability, we ensure our readers have all of the information they need before spending their hard earned money. We also focus on news and rumors within the mobile device world in feature articles that are published several times per week.